Michael Marcell, a WKU student with a double major in International Affairs and Journalism, was awarded a William Jefferson Clinton Scholarship to study at the American University in Dubai during the Spring 2011 semester. Marcell, of Louisville, is the son of Carolyn and Charles Marcell. “It’s an incredible honor and privilege to be able to represent WKU while pursuing a critical piece of my International Affairs education,” Marcell said. The William Jefferson Clinton Scholarship is offered through the Clinton Presidential Foundation and the American University in Dubai. The goal of the scholarship is to give American students the opportunity to study in the Arab world. The Clinton Scholarship will pay for Marcell’s tuition, room, and board while he is studying in Dubai. Marcell was first introduced to the Middle East and Islamic cultures through his year-long deployment as a sergeant in the U.S. Marine Corps in Iraq and the United Arab Emirates. His experience made him realize that he would like to return to learn about the beauty and sophistication of the Arab world outside a combat theatre. When Marcell finished his tour of duty and returned to his university studies, he decided to focus on broadening his knowledge of the Middle East. 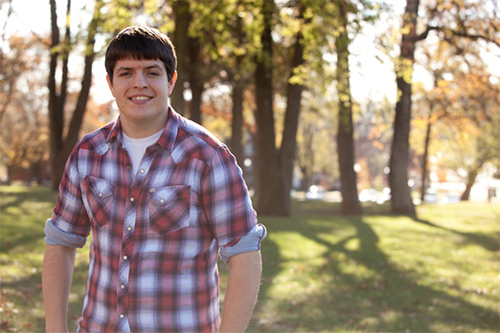 In addition to coursework in his two majors, Marcell is pursuing a Certificate in Middle East Studies at WKU. As part of that certificate program, he started formally studying Arabic, and is currently a student in Khiri Elkut’s Intermediate Arabic class at WKU. While in Dubai, Marcell will continue the studies of Arabic that he began at WKU. Marcell plans to pursue a career in federal service after graduation. Marcell was assisted in his application for the William Jefferson Clinton Scholarship by Jeanne Sokolowski, International Scholarships Coordinator at the Office of Scholar Development. “Were it not for the help I received from Jeanne Sokolowski and the Office of Scholar Development staff, I’m sure I would have received a letter of encouragement rather than a letter of acceptance,” Marcell said. Sokolowski is also working with Marcell on his applications for a U.S. Department of State Critical Languages Scholarship for Summer 2011, and the National Security and Education Program (NSEP) Boren Scholarship for 2011-2012. Dr. Audra Jennings, the domestic scholarship adviser at the Office of Scholar Development, is working with Marcell on the Pickering Undergraduate Foreign Affairs Fellowship. About the William Jefferson Clinton Scholarships: The Clinton Presidential Foundation, in partnership with the American University in Dubai, offers 10 scholarships per semester to U.S. citizen students enrolled as fulltime undergraduates. The scholarship provides American students the opportunity to expand their educational and cultural horizons by studying in the Arab world. About the Office of Scholar Development: The Office of Scholar Development is committed to helping students on all campuses and in all majors and degree programs develop the vision, experience and skills to be independent, engaged scholars. Students interested in investigating undergraduate opportunities such as the Critical Language Scholarships or the NSEP/Boren fellowships should call to schedule an appointment with the Office of Scholar Development at (270) 745-5043. About Arabic at WKU: WKU currently offers first and second year Arabic. Arabic instructors at WKU are Khiri Elkut, a Fulbright Language Teaching Assistant from Libya in 2010-2011, and Khaldoun Almousily, a teacher, interpreter and translator of Arabic who received his degrees at the University of Amman in Jordan. In spring 2011, students will have the opportunity to complete both semesters of first year Arabic on a bi-term schedule. For more information about Arabic language classes at WKU, contact the Modern Languages Department at (270) 745-2041. Contact: Jeanne Sokolowski, (270) 745- 2764.